In 2016 we should walk so closely with God that we discern His guidance as we live in obedience to His Word, being led by His Spirit. How do we know God’s will? First of all, you must write God a blank check with your life. You can’t speculate what God’s will is for your life this year unless you are totally committed to obeying it. God isn’t a travel agent who arranges your itinerary and then asks for your opinion. He is the Lord, and it’s true that He loves you and has a wonderful plan for your life in 2016! But you must whole heartedly give your life to him, trusting that His will for you is good, acceptable, and perfect (Rom. 12:1-2). Secondly, grow to know Him more intimately through His Word and His Holy Spirit. I’ve been married to Angie for almost 25 years now. On many matters I could tell you what she would want without asking her opinion. I know her will because I know her. In the same way, knowing God’s will in a specific situation is very much bound up with knowing God Himself. There are no shortcuts to knowing the Lord. It’s a process that requires diligently seeking Him in His Word and in prayer over a span of time. God has designed life so that you have to make some of the biggest decisions (career, marriage) before you really have the maturity that you will have later in life. That’s why it is so important for you to seek wise counsel from those who have followed the Lord for many years, including your Christian parents. Take advantage of the wise counsel of those who do know Him well. Thirdly, act on biblical principles, not human wisdom. God’s wisdom and ways are in opposition to man’s wisdom and ways (Isaiah 55:8-9). Sometimes God wants us to do something that goes against human logic. I am confident that this will be the case for you this year. Remember, no matter where God tells you to go, your steps are ordered by Him. Fourthly, analyze your gifts, motives, and desires in light of God’s sovereign purpose of being glorified among the nations. It is possible to be committed to doing the Lord’s will, but to be in the wrong place or position. A key question, which is not always easy to answer, is, “Where can I be the most effective in furthering God’s kingdom in light of my gifts?” For example, I have a heart for the youth of America as God has directed me to publish and distribute the Truth for Youth Bible. We have given away more than 2 million of these specially designed Bibles and witnessed more than 25,000 come to Christ as a result of these efforts. However, I don’t consider myself to be a tremendous youth communicator like Rich Wilkerson Jr., Sean McDowell or Jeffrey Dean. Although we have many youth come to the Lord in our services, my gifting to reach young people is best utilized through the distribution of the Truth for Youth. Fifthly, listen to and prayerfully evaluate the counsel of godly believers. This is not easy to do. Acts 21:4 says that “through the Spirit” the believers told Paul not to set foot in Jerusalem. No doubt, Paul’s desire for Christian unity and for the salvation of his fellow Jews, along with his resolve, in this instance caused him to make a mistake. He should have listened to the warnings of the Holy Spirit though other believers. At the very least, he should have paused to prayerfully consider the counsel of these godly believers. If Paul had not gone he could have made it to Rome and Spain much sooner than he did. We probably can’t know for sure this side of heaven whether Paul was right or wrong. But even if he did make a mistake, God was still at work through Paul to accomplish His sovereign will. Through Paul’s arrest he got to preach the gospel to both the Roman and Jewish leaders. My point is, you should always listen and evaluate godly counsel that you receive. And finally, in dependence on God, follow your best judgment, conscience, inner peace, and convictions, submitting to the consequences. Ultimately, you must determine God’s will for your life. You can’t blame others for the decisions you make. I realize that having “inner peace” about a decision is not an infallible guide. I’ve known Christians who “had peace” about a decision that was sinful. But if the decision is morally neutral and you have been depending on God, there is a place for His peace to guide you. What if you make a mistake in determining God’s will for your life concerning 2016? If you come to realize that your mistake is a result of stubbornness, self-will, or pride, confess it and ask God to overrule your mistake. God used Paul’s prison years for His glory, and He can use your mistakes if you submit to Him and seek to please Him. The process of finding God’s will begins when you trust Christ as Savior and write Him a blank check with your life, being willing to do whatever He calls you to do. Several months ago we began converting the Revival Fires Ministries garage to an additional location for us to house more Truth For Youth Bibles. The demand to get these into the hands of young people across America has sky rocketed as we are distributing thousands of these to teens on a regular basis. Mike and Will Wade insulated the garage. AC Mike Harris from Dallas area put a climate control heat/air unit in. Cody Earnest put down pallets, plywood and cleaned it up. Monday we unloaded 50,000 TFY Bibles into it with the help of several men of God from Harvest Assembly, Randy Dodson from Lapine Assembly and 10 men from City of Faith. As Randy Dodson was leaving he said, you ought to share your testimony with the City of Faith men. We finished unloading 45 minutes early because of the convenience and closer proximity of the garage. Once everyone else left I sat out on the TFY bibles for 45 minutes with the ten City of Faith men as we waited for their “pick up” van. I shared Pastor John John Skipworth testimony then my testimony with them. The Holy Spirit was drawing them as several wept. I was privileged to pray with all ten of them to surrender their hearts to Christ. God used Mike & Will Wade, AC Mike Harris, Cody Earnest, Randy Dodson, Pastor John Skipworth and no doubt many others that I don’t even know about. I Corinthians 3:6 lets us know, some plant, some water, but God gives the increase. Thank you to all of these mighty men of God for allowing God to make you usable to plant and water seed and bring in a harvest!!! I was honored to share my testimony in a large high school in Clarendon AR. The principal allowed me to give an altar call for salvation and EVERY student got saved or rededicated their life to Jesus Christ!!! I was also able to give a Truth for Youth Bible to every student that wanted one. Every student took a Bible! The students in this school will never be the same!!! Principal Cathy is as bold as the lion that is their school mascot. Thank God for public school administrators that are willing to take a bold stand for God on their campus!!! This precious woman of God was instantly healed of spinal stenosis in one of our recent revivals. Thank God for His healing virtue. 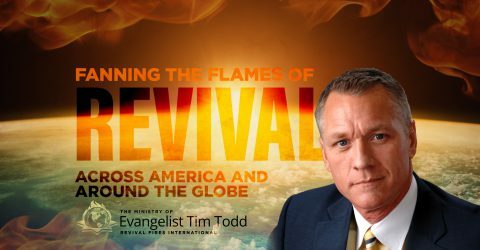 Last year in our Revival Fires services we had more people getting saved, filled with the Holy Ghost, healed, delivered and set on fire for God than in any of the previous 28 years of evangelistic ministry. Ready to see what God is going to accomplish this year! Excited to announce, Noah Erickson has just come on staff at Revival Fires International as my new Administrative Assistant. Our pastor, Shane Warren, is photo bombing in background. We will miss my previous assistant, Tammie Tarver, and pray for God’s greatest blessings in her transition as her husband took on a new job in Texas. Excited about having Cody Earnest traveling with me as an intern. He is a tremendous help and blessing. God has great plans for his life and ministry. We are pictured here during a Holy Ghost turned on revival with Pastor Melvin Ware from West Bay Assembly of God in Dickinson TX having our cake and eating it too!